Tall and graceful, with traditional Tiffany style shades of unusual beauty, now made with the finest handwoven wicker. 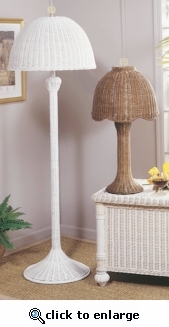 Floor lamp fits well besides a chair or sofa while the table lamp graces any reading table. White or Natural finish.